Among the many record books that have come temporarily to the keeping of this writer, none is more fascinating than the one in which the Croasdale family purchased from Richard Graham and Clara F., his wife, in September 1894, the old Blue Ball Inn. Now almost 58 years later its possession has passed from Mrs. Croasdale to Mr. and Mrs. Paul McCurdy Warner, of Wayne who are remodeling and renovating the old house without making any more structural changes than the Croasdales had already made, thus preserving the charm of the really lovely old house which stands at the intersection of Old Lancaster road and Russell road in Daylesford. The Brief of Title to the property which is the first item in the old record book except for two early pictures of the house, shows that “a tract of land in Chester County containing 212 acres” was deeded to Owen Roberts “by WIlliam Penn, proprietor and governor of Pennsylvania” by patent dated July 28, 1714. This copy of the record of ownership as it changes with the years is complete in every line through tot he deed of September 28, 1894, transferring the property from the Grahams to John P. Croasdale. To this old record will soon be added a copy of the transfer of the one time Blue Ball Inn and approximately two acres of ground to Mr. and Mrs. Warner. Following this listing of ownership in the old record book is a quaintly illustrated article clipped from Harper’s Magazine of April, 1880, entitled “Some Pennsylvania Nooks”. Among the historic places described in it are the Anthony Wayne Homestead, Washington’s Headquarters, Old St. David’s Church, Paoli Monument, Blue Ball Inn and Spread Eagle Inn. The latter are among the most famous of all the old hostelries that once dotted the Lancaster Turnpike. Other data which the Croasdales have collected in their book include excerpts from “The Making of Pennsylvania” written by Sydney George Fisher in 1898 in addition to liberal quotations from various articles by Julius F. Sachse devoted in whole or in part to “Ye Blue Ball” in Tredyffrin Township. The “North American” of January 4, 1902, ran a special feature article on the “Six Skeletons of Long Ago” that had just then been unearthed in the cellars of the Blue Ball. “House Beautiful” in May, 1929, featured a copiously illustrated story of the Croasdale home as it looked both on the inside and from the outside at that time. And as short a time ago as March 12, 1939, “The Philadelphia Inquirer” had many “posed” pictures in its rotogravure section portraying the sinister events that supposedly took place in the old inn during the ownership of Prissy Robinson, daughter of the Bernhard Vauleer who acquired the tract of land and the first small Blue Ball Tavern in 1759. Naturally there is some diversity in the details of a story so often told and retold. For one thing there is a margin of ten years or more in the matter of the exact date on which the second inn was built, a larger and more pretentious stone house than the first small one. Both were on the 200 and more acres deeded by William Penn to the first owner of the land. But the second one was considerably to the north of the first one, and directly on the stone turnpike which was completed in 1794. The Warners themselves have apparent evidence of the fact that the second Blue Ball Inn which will soon become their home was built in about the year 1790, thus making the house more than 160 years old. Whatever its exact age, it is undoubtedly a charming house, surrounded as it is by two well shaded acres and the gardens which the Croasdales have planted with such loving care during their almost sixty years of ownership. At this season of the year daffodils are showing their golden heads on every side. Pale primroses are coming into modest bloom as are many of the spring wild flowers. The peonies which will bloom so much later have been undisturbed for all of sixty years. And there are lily gardens, too, and a swimming pool, not very long or wide, but five feet deep. And a frog and lily pond. There are old paths among the flower gardens and these flower gardens are hemmed in by hedges, beyond which is the long view to the Great Valley. Altogether a charming spot to be made much more so by a season or two of care. In front of the house which is at the present intersection of Old Lancaster road and Russell road stands the original hitching post bent with time and use, its iron ring still firmly imbedded in the wood. Beside it is the “mounting block” which has now sunk to the level of the ground. The house itself is made of old Pennsylvania trap stone, three stories high, though originally it was but two. The main entrance faces the road. The present door will soon be replaced by the more interesting original one with its nice old hardware, found in the stable by Mahlon Rossiter who is in charge of remodeling the house. The original fan light of the doorway is still in place. On the left side of the house is a wide pleasant porch, probably added to the stone house, not too many years after it was built. Within the past 50 years or so a second story has been added to the porch which, while not architecturally quite in harmony with the house still adds its note of charm and summer comfort. Back of the porch is a trick door, with an intriguing secret wooden lock, which leads to a comparatively unimportant spot, the woodshed. The present kitchen was added onto the east side of the house possibly seventy-five to a hundred years ago, with its doorway leading into the large front room. In it is a charming corner cupboard as old as the room itself. For convenience of living this kitchen will of course be modernized to some extent by the Warners without changing its contours. For travelers making their slow and ofttimes weary way from Philadelphia to Lancaster in the 1700’s, the most important factor of their journey was the wayside inn which gave them shelter for the night as well as refreshment during the day. By 1794 the Lancaster turnpike, the first stone turnpike not only in the state of Pennsylvania, but in the entire country, was completed. Extending the 62 miles between Philadelphia and Lancaster, it became the pattern for all subsequent hard roads in the United States. It was then that “the highest development of the wayside inns was reached”, according to J. F. Sachse in his book, “The Wayside Inns on the Lancaster Highway”. Even before the time when there were any inns at all along the highway, travelers secured shelter and food at private houses where “it was the custom of those who resided near the highways, after supper and the religious exercises of the evening, to make a large fire in the hall, and to set out a table with refreshments for such travelers as might have occasion to pass during the night”, according to an early historian writing in 1738. The first inns that sprang up along the highway were small crude buildings, often scattered at some distance from one another. But after the stone turnpike was completed in 1794, the increase of travel along it necessitated the erection of many hostelries in addition to these first early ones, until eventually they averaged about one to the mile. This was especially true as the distance from Philadelphia increased, and there was greater need for meals and overnight accommodations. These later ones were usually larger and of better construction than the earlier small crude structures. One of the earliest of these small inns was that originally known as the “Halfway House”, according to an article written in 1886 for the West Chester “Village Record”. This “primitive stone house, roughly built of the stone found on the surface of the ground”, was in Tredyffrin township, on the borders of Easttown, about a mile west of eh village of Berwyn, just south of the railroad, where the turnpike crosses underneath the iron highway . . . in a slight ravine or valley formed by a spur of the valley hill.” It was located on the south side of the narrow road which “was then the only means of reaching the outlying settlements towards Conestoga.” And it was called Halfway House, not only because it was “about equidistant from the Schuylkill (Coultas) ferry and Downings Mill (near Downingtown)”, but also because “it occupied the same position on the road connecting the two Welsh congregations of the Church of England, viz. : St. David’s (Radnor) and St. Peter’s (Great Valley)”. The exact date of the building of this small stone structure is not known beyond the conjecture that it was in the first quarter of the 18th century. 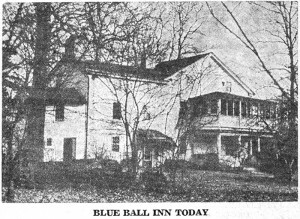 In 1735, when it came into the possession of one Robert Richardson, it became known as the “Blue Ball”, under which name the original house as well as its successor, built somewhat to the north of it, attained the status of a celebrity that lasts down to the present day. For a short period of time in the middle years of the Eighteenth century the name was changed to “King of Prussia” by Conrad Young, a new landlord who was a German. However, according to the author, the “traveling public and residents do not seem to have approved of the change on the signboard, so the inn continued to be known as the “Ball”. Old records show that from time to time tavern licenses were issued to succeeding owners of the Blue Ball. Then in 1794 the completion of the new stone turnpike cut the old hostelry almost completely off from its patrons. Also the erection of more comfortable inns situated directly on the new turnpike made serious inroads on the business of the Blue Ball. But in spite of this, old records show that a John Werkizu obtained licenses for the years 1797-99. But all this somehow seemed far away and unlikely on a spring afternoon last week when this writer wandered through the lovely old gardens of the one time Blue Ball Inn and explored the 150 year old house with Mrs. Paul McCurdy Warner, who with her husband has recently acquired this property. For seventeen years the Warners have lived in Wayne, first on Conestoga road, later on Midland avenue where they have resided for the past 12 years. Mr. Warner, who has been with the Philadelphia “Inquirer” for 27 years, is now its editorial director. Both are much interested in community affairs. Mrs. Warner has been active in the work of the Neighborhood League for some years, serving now as chairman of the Family Service Division. She has also interested herself in the Radnor Township Memorial Library, of which she was president for several years. She takes an active part, too, in the operation of the Delaware County Branch of the Philadelphia Child Guidance Clinic. Both Mr. and Mrs. Warner have always wanted to buy a really old house, and do it over themselves. 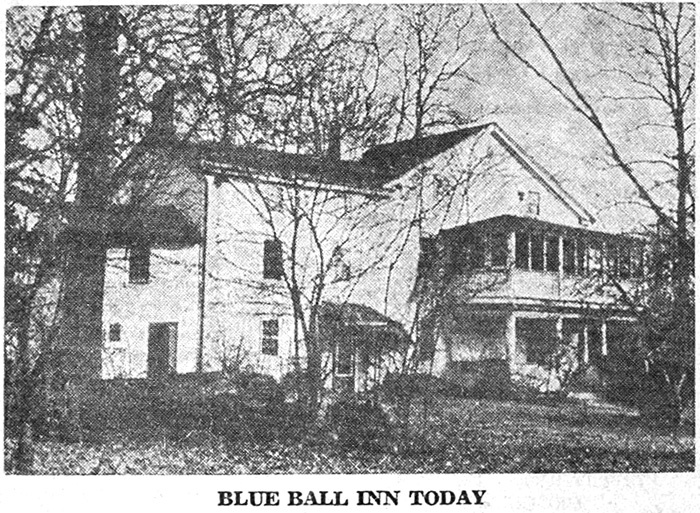 Their opportunity came recently with the purchase of the one time Blue Ball Inn from Mrs. John P. Croasdale, whose husband purchased it in 1894 from Mr. and Mrs. Richard Graham. When the Warners move in May as they hope to do, the quaint old house will be in livable condition after builders and painters have done their work. But there will still be months, perhaps even years ahead for them to do for themselves the many things that make a house a home. The report of Edwin J. Clark, chief of the Radnor Fire Company for the year extending from April 1, 1951 to April 1, 1952, shows that in that period of time 608 calls were answered by the Company. Of these, 279 were fire calls and 329 were those for the ambulance. The fire trucks travelled a total of 2,907 miles answering calls, that in variety ran all the way from the Ryan and Christie fire in Bryn Mawr to a “cat in the tree” and “birds in the chimney” as these last two calls are listed in the report. The men went out in all sorts of weather, including 24 rainstorms and eight snowstorms. And while 201 of these calls came in form 6 A. M. to 6 P. M., 78 of them came between 6 P. M. to 6 A. M. Average hours of service were 217 1/2 for each fireman. With the exception off one full time employee who lives at the Fire House to receive incoming calls, none of the active firemen receives any compensation. Responding to the multiple fire alarm for the Ryan and Christie fire, Radnor men and apparatus arrived in Bryn Mawr at 8:00 o’clock on Wednesday evening, February 28, 1951, and remained through the bitter cold of that winter night on until 11:00 o’clock Thursday morning. Dense smoke, with little flame, made the work of the firemen difficult from the beginning. Some 30 men from the various companies were overcome by smoke, while one Bryn Mawr fireman died a few days later as a result of the injuries he sustained. Throughout the night and early morning fire ambulances, including Radnor’s, stood by, ready for any emergency that would necessitate a run to nearby Bryn Mawr Hospital. Two disastrous accidents in 1951 brought out the Radnor Fire Company, the first on April 26, when an East-bound and a West-bound trolley met in a head-on collision just west of Wayne-St. Davids trolley station. The second occurred on May 16, when the “Red Arrow” train of the Pennsylvania Railroad plowed intuit he Philadelphia Night Express west of Bryn Mawr station. Radnor firemen, arriving without delay on the scene of the first accident, freed the seven seriously injured passengers from the wreckage and within half an hour’s time had all of them in Bryn Mawr Hospital by way of their own ambulance and those from Berwyn and Paoli. At the Pennsylvania Railroad wreck, which resulted in the death of eight persons and the injury of 60 more, three Radnor fire trucks with the ambulance were on duty for hours, the former assisting with the work of rescue and the latter with the transportation of injured to the Bryn Mawr Hospital. They were but one of many such groups that responded to the emergency call. Thus far in 1952, the two most serious fires to which Radnor has been called have been that at Dr. McFarland’s Paoli home, which resulted in a loss of about $25,000, and the Smith warehouse fire in West Chester, with a loss of $100,000 or more. In discussing the matter of training volunteers for their important work of firefighting and rescue, Mr. Clark says that not only does he have no difficulty in obtaining these men, but that usually there is a waiting list for any possible vacancies that may occur. Once admitted to the Fire Company, there is a six months’ period of probation before final acceptance. Also, for three months no new fireman is permitted to go into a fire unless accompanied by an old-timer. In the meantime, there are fire drills for new and old firemen alike. From April 1 until October 1 these are of weekly occurrence, while from October 1 until April 1 they are held monthly. Much of the technique of the newest methods of fire fighting is acquired at the Fire School held in Lewistown each year by the Pennsylvania Department of PublicInstruction. Radnor Fire Company endeavors to send one or more representatives to each session, Chief Clark himself rarely missing one. At the local fire drills not only these newest techniques are taught but amateur firemen learn all ladder practices, including the proper raising, carrying and climbing of ladders. From discarded lumber a two story house has been erected on the old sewage plant on Ivan avenue. Here firemen are taught the putting out of blazes by fog methods, and techniques of rescue. For the latter a smudge fire is usually started in the frame building, and somewhere in the depths of it, most often on the second floor, a dummy is hidden. Wearing masks and carrying a litter, firemen are trained to find and to rescue this dummy, just as they may be called upon to rescue persons overcome by smoke. Other fire drills, pertaining to the proper use of ladders, have been held on the outside of the Wayne Primary School building from time to time. First Aid training is also given though a great deal of the knowledge comes through actual experience on the ambulance. Those who attend the Fire School in Lewistown receive courses in advanced first aid. Due to the fact that several of the active firemen were called into the service following America’s entry into World War II in December, 1941, a number of High School boys were trained as active firemen to take their places. Well does the writer remember the pride her own son took in this assignment, the discipline and the training, which were to serve him in such good stead less than a year later when he, too, entered the service. The first group of boys to be trained consisted of Malcolm Murphy, Davis Washburn, Joe Young, Carter Lippincott, Jack Fogarty, George Ott, Tom Mell, Bill Clark and Bill Patterson. There have been many others since then, each in turn considering it a great honor to be chosen. At present the group is limited each year to six senior class boys, who must have special releases from the school as well as written permission from parents. While they are firemen, they are not allowed to participate in any school sports. They may leave any and all classes at the first sound of the siren, and run to the Fire House, which conveniently adjoins the High School. They have, according to Chief Clark, proved of invaluable assistance, especially for daytime fires. Exclusive of these six school boys, the total crew numbers 33 men, headed by “Eddie” Clark, who has been Fire Chief for the past 20 years. Leslie D. Wilkins, who is not only the chief engineer, but the secretary of the company, has served in the latter capacity for 17 years. Both men are sons of charter members of the company. Assistant Chiefs are James Kane, Wells Walker and Edward Gallagher, Jason L. Fenimore is president of the Company; William M. Zimmermann, Jr., vice-president; Arthur T. Stillwell, treasurer. Directors are Hon. Benjamin F. James, Ralph Robson, Harry Simes, Grover Lengel, Rocco A. Odorisio, Harry Campbell, Jr., and John Ferguson. The Fire Company’s budget is met each year by a certain amount derived from taxes, by contribution from the Township Board of Commissioners and yearly dues varying from three dollars for annual membership to $25 for sustaining members. The company has recently been the recipient of funds derived from the Wayne Rotary Basketball Tournament, and the Lions Main Line Charity Ball, to be held on Friday evening, April 18, will be for their benefit. These funds will be used for maintenance expenses. Among the most needed pieces of new equipment are a smoke ejector, two 500-gallon capacity fog nozzles, new ladders, two “walkie-talkie” radio sets and additional radio equipment. Other desirable additions would be two more portable oxygen units and a modern and a portable pump unit which would make it possible to draw water from a distance of 500 feet, at the rate of 250-300 gallons each minute. The present building which houses the Radnor Fire Company looks very different from that first small one built in 1890 by the Wayne Public Safety Association, although, as a matter of fact, the latter is incorporated in the former. This original fire house is the square, two story northeastern section of the building which has the caretaker’s quarters downstairs and the assembly room upstairs. When it housed the horse drawn engine it had an entrance both onto Audubon avenue and onto the open field in the back. Each doorway was wide enough for the firemen to drive the fire engines through. Soon after the acquisition of the two automobile engines in the early nineteen hundreds, the first building was moved backward on the lot and a front section added, retaining, however, the tower which still remains on top of the building. Then in 1936, another addition and some further improvements were made, including alterations to the front which made possible the small upstairs balcony and changed the appearance of the front of the building. In the course of various improvements, the original frame part was encased in brick, making for greater uniformity of appearance. When the ambulance was purchased in 1947, it was at first crowded into this building as it was at that time. However, in 1948, the addition to the south was built as a means of more adequately accommodating the ambulance, as well as one of the five fire engines now in use by the Radnor Fire Company. The front upstairs room is used for recreational purposes while the back room is used for the monthly meeting of the Fire Company. Close inspection of the fioor shows marks where desks were once screwed down when this room was used some fifty years or more ago as one of the class rooms for the Radnor Public Schools. The gavel on the long table in the present room is in the shape of a wooden block on the side of which is a silver plate inscribed with the names of the various presidents from that of William W. Hearne, who took office, down to Jason L. Fenimore, the present incumbent. Mr. Hearne, who held office until 1911, was succeeded by Eugene C. Bonniwell whose term extended until 1914, when Mr. Hearne again took office until 1917. Jonathan D. Lengel was president from 1917 to 1921; Charles E. Clark from 1921 to 1925; Charles M. Wilkins from 1925 to 1928; Ira V. Hale from 1928 to 1930; David H. Henderson from 1930 to 1947 and John J. McGovern from 1947 to 1951, when Mr. Fenimore took office. Meetings are called to order by striking the bell now hanging on the wall, originally the one which clanged its way to all fires from the front of company’s first motorized fire engine. Incidentally, this first engine was smashed on its way to a fire, Charles Clark tells your columnist, instead of rusting away on the vacant lot back of Lienhardt’s as stated in this column. However, the second engine did meet this fate when instead it might have been preserved by the Waterous Company who wished to put it on exhibition in their St. Paul plant. Leslie D. Wilkins, secretary of the Fire Company for a number of years past, as well as its chief engineer, tells us that the present system of sirens was installed in the early 1920’s. During the first years of the original fire company, a big iron rim from a locomotive wheel had its permanent place in front of the fire house. This rim was struck by a hammer when a fire alarm came in. The noise was so resounding that it could be heard pretty well around the town, thus calling the firemen into action. Even as far back as 1906, the Fire Company kept a man on 24 hour duty, one of the first of these watchers being “Old Dad Watson”, a tall colored man still remembered by many people in Wayne. There was always a telephone in the firehouse and the telephone operator called the firemen at their homes. Prior to the time of the installation of the present siren system, the loud whistle on the top of the steam heat plant gave the signal for firemen to assemble. In summer when the plant shut down it was necessary for a time to ring a bell. Mr. Wilkins well remembers the small auxiliary bell at the side of his father’s house on Aberdeen avenue which notified all the firemen in that neighborhood of any fire. Eventually a group of women in the town got together and planned for a “Tag Day”, when they stood on street corners and sold tags with small whistles attached, thus starting the fund for the purchase of a siren. After the permanent discontinuation of the steam heat plant a few years ago, it became necessary to depend entirely on the present siren system, although up to that time the siren at the plant was always used in winter for serious fires. One of the most unusual undertakings of the Radnor Fire Company was their trip to Louisville, Ky., in February, 1937, to aid in relief work made necessary by the flooding of the Ohio and Mississippi rivers, following heavy rains. Those who went were Charles E. Clark and his son, Edwin J. Clark, the present fire chief, James Kain and James Conway. With Louisville as their ultimate destination, they went as far as Harrisburg in the fire engine which they were taking from Wayne. Then a special train was provided for all the equipment which had been volunteered from various sections as well as the firemen to man these engines. They entered the flooded area at Indianapolis, from which point on the going was tedious and difficult. Once arrived in LouIsville they found themselves installed in a warehouse of the American Tobacco Company where, along with all the rest of the volunteer firemen from Pennsylvania they were under the able direction of Chief Deen, of the Lancaster (Pa.) Fire Department. Of these volunteers, the men from Radnor were the only ones from a district smaller than a third class city. Conditions everywhere were bad with many buildings afloat and many people trapped by fire and water. Among the many strange sights was that of a huge Ohio River steamboat stranded in the center of a golf course.